Geological storage and sequestration of carbon dioxide, in saline aquifers, depleted oil and gas fields or unminable coal seams, represents one of the most important processes for reducing humankind’s emissions of greenhouse gases. 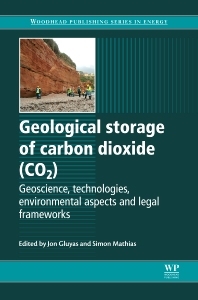 Geological storage of carbon dioxide (CO2) reviews the techniques and wider implications of carbon dioxide capture and storage (CCS). Jon Gluyas is Professor in Geo-Energy and CCS, Department of Earth Sciences, Durham University, UK. Dr Simon Mathias is a Reader in Computational Geoscience, Department of Earth Sciences, Durham University, UK.